A sublime performance by the Subaru do Motorsport team has seen it seize first place overall after today’s Heat 2 of Subaru Rally Tasmania. The team were initially showing second overall, but a review conducted by Confederation of Australian Motorsport (CAMS) officials, regarding a re-entry to the day’s first stage by event leader Eli Evans, led to an end-of-day penalty for the Skoda Fabia R5 crew. It is expected Evans and co-driver Ben Searcy will challenge the stewards decision. Heavy rain added to the challenge on Heat 2, but Molly Taylor and co-driver Malcolm Read, in the Production Rally Car (PRC)-class All-Wheel Drive WRX STI, maintained a cool, calculated approach. With the WRX STI prepared to perfection by Launceston-based Les Walkden Rallying (LWR), the crew’s local knowledge and professionalism proved an asset right across the weekend. The WRX STI continued to run faultlessly today while some other key competitors faltered. Championship leader Evans lost more than five minutes on the first stage, SS12, in the run-off incident that subsequently gained stewards’ attention. The Subaru do crew’s third overall after SS12 was bettered with a rise to second on SS13, thanks to a sure-footed approach on some incredibly muddy and slippery forest trails. The day’s equal-longest stage, SS14 – at 24.99 kilometres – further entrenched Taylor and Read’s second spot, going into late morning service ahead of the three repeated stages. 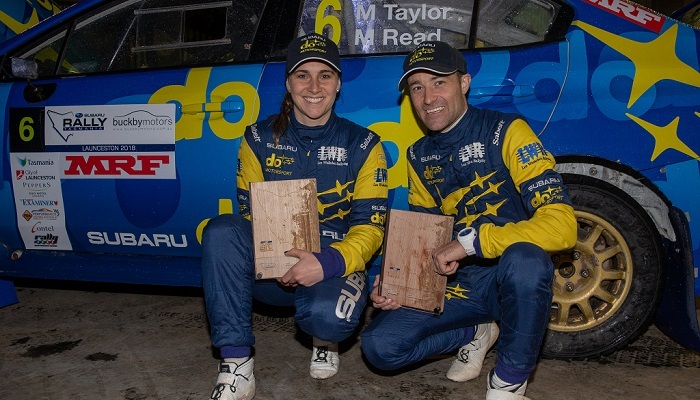 Despite deteriorating conditions, with countless washaways and potholes adding to the on-stage lottery, the Subaru duo maintained their composure and podium contention. At the end of the action, the team initially anticipated a third or fourth place finish on the Heat – and a second or third on the podium. But the team, together with rally fans gathered for the podium presentations, were all surprised by a one-hour delay to proceedings, prompted by the officials’ enquiry into the circumstances of the Evans re-start. Molly said: “I think we were all taken aback by the announcement and, of course, it’s still subject to appeal by Eli’s team. “Having said that, from our perspective, it’s fantastic to be back on the podium. “Firstly, it puts our championship challenge very much back on track, with two rallies still to go. “We’re also very happy to get this result in Les’s back yard. Les and the crew kept the car running perfectly all weekend, so we couldn’t have asked for more. “And finally, it’s great to do it for Subaru at an event sponsored by them!